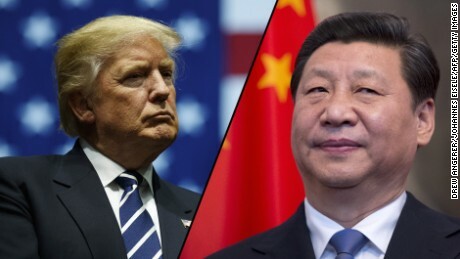 Hong Kong (CNN) Two US Navy aircraft carrier strike groups have arrived in the Pacific in the past two days, putting three of the massive warships in the region as President Donald Trump prepares for a visit early next month. The carriers USS Theodore Roosevelt and USS Nimitz — and their respective complements of cruisers, destroyers and submarines — have arrived in the US Navy’s 7th Fleet area of operations, which covers the eastern Indian and western Pacific oceans, the Navy said in separate news releases this week. 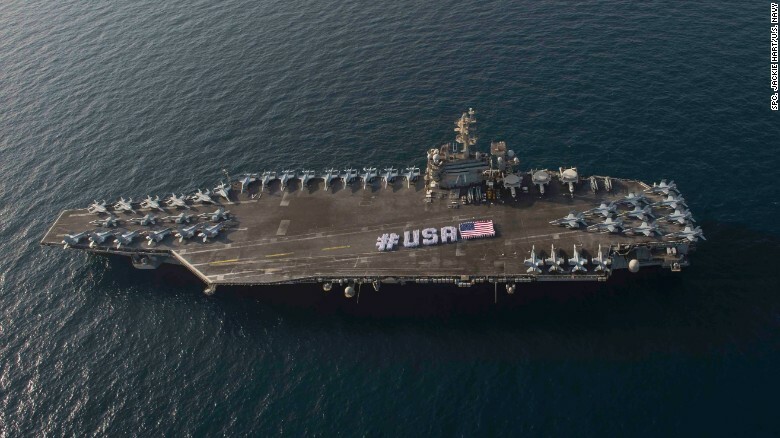 The Roosevelt and Nimitz join the USS Ronald Reagan, which is based in Japan and has been engaged in exercises with South Korean forces in the past week. Those exercises have drawn harsh criticism from North Korea, which sees any US military drills as rehearsals for an attack on Pyongyang. While the Navy statements do not give any specific missions for the Roosevelt and Nimitz, the presence of the additional carriers is certain to draw attention in the region. 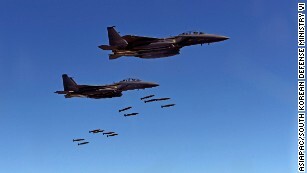 The presence of the three carriers will send a message to China as well as North Korea, said CNN military analyst John Kirby, a former US Navy admiral. China has been building fortifications on islands and reefs in the South China Sea and upgrading its fleet with new warships, including its second aircraft carrier, launched earlier this year. China was also critical of US naval movements in the region after two US guided-missile destroyers collided with merchant ships earlier this year. Despite the accidents, which crippled the two US warships involved, the US has not curtailed operations in Asia. With the movement of the carriers and their escorts, the US is “making sure China knows it’s still the predominant force in the Pacific region,” Kirby said. The Nimitz and its escorts come into the region from the Mideast, where it was participating in strikes against ISIS as part of Operation Inherent Resolve for the past three months. The Roosevelt left San Diego in early October and is expected to eventually head to the Mideast. While the movement of the ships is scheduled, Kirby called it “a nice confluence,” with President Trump beginning a 12-day Asia visit in early November which will include stops in China, Japan, the Philippines, South Korea and Vietnam. “The Navy is taking advantage of a scheduling overlap to demonstrate its capabilities to potential adversaries,” Kirby said. Having three carriers in the region is rare and gives the Navy “an elevated posture just prior to the President’s trip,” Mount said. Capt. Carlos Sardiello, the Roosevelt’s commanding officer, said the ship could be called on for “the full spectrum of possible missions, from humanitarian relief to combat operations” while in the Pacific. “When a carrier leaves on deployment, we have to be ready for anything,” Sardiello said in a Navy press release. Both the Nimitz and Roosevelt will make port visits while in the region, the Navy statement said without specifying any specific destination. Traveling with the Nimitz and Roosevelt are nine cruisers and destroyers equipped with the Aegis anti-missile system, which has been promoted a key defense against any possible missile attack from North Korea. As those nine ships moved into the region, other Aegis ships from the US, South Korea and Japan are participating in a missile tracking exercise in waters off South Korea and Japan, according to statements from the South Korean and US militaries. The two-day exercise, which began Tuesday, is designed to “prepare the three nations’ missile detection and tracking ability against North Korea’s growing nuclear and missile threat,” according to a statement from the South Korean Joint Chiefs of Staff. “Each nation’s Aegis destroyers will detect and track and share information on a virtual target simulating a North Korean ballistic missile,” the statement said. The US’ Aegis fleet in the Pacific has been hurt this year by the loss of the guided-missile destroyers USS Fitzgerald and USS John S. McCain, both severely damaged by collisions with merchant vessels. The Aegis ships in the Nimitz and Roosevelt groups could be called on to fill any gaps left by the absence of the Fitzgerald and McCain, Mount said. Jake Kwon in Seoul contributed to this report. Next ›Dự trữ ngoại hối tăng “sốc”: nên mừng hay lo?